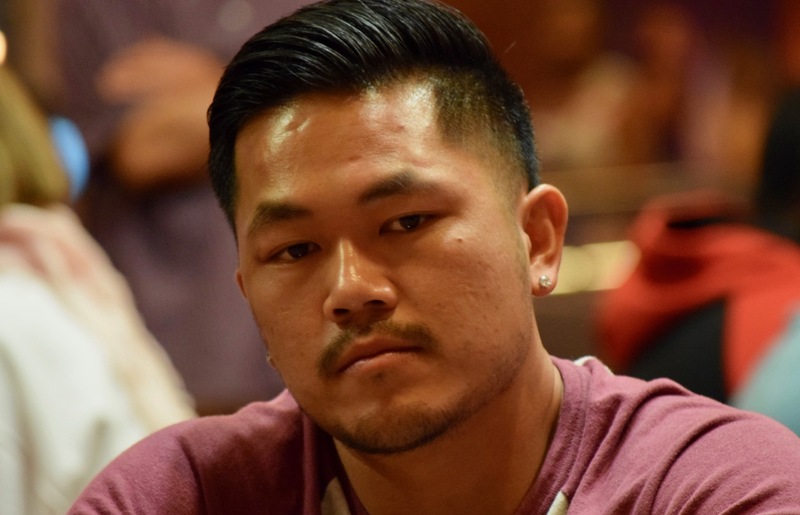 Tyler Martin makes it 82,000 on the flop, and Tuan Mai repops him to 220,000. Martin pauses, verifies the count, and calls. The turn is what appears to be an insignificant . Martin leads out again, 175,000 is announced, leaving him about 500,000 behind. Mai has about 540,000 total, and after about 20 seconds, he announces all-in. The tournament has gone on break as this hand plays out, and most of the remaining players, plus a number of spectators, have gathered around the table. "Did you do that because of the crowd, of the people watching?" asks Martin, and Mai just grins. The 10-minute break grinds down to 3 minutes, and Martin finds a fold. Mai is now chipleader with close to 1.3 milly.